roasted salmon, mango, avocado, cherry tomatoes, black olives,fresh herbs, golden raisins, organic quinoa. Due to our Special Brunch Cocktail Pricing, An automatic 18% gratuity will be added to the Pre-Discounted bill. Hotel Chantelle proudly serves Unlimited VIVREAU Still or Sparkling water for $1 per person. NYC tap water is available at no extra charge. **Consuming raw or undercooked meats, poultry, seafood, shellfish, eggs, may increase your risk of food-borne illness. "... Each of my restaurants are quite different in concept and menu. Hotel Chantelle is a very playful, fun menu. It’s creative, modern, American food, which allows me to create anything really. It’s my place to be “Willy Wonka,” with presentation and food pairings." 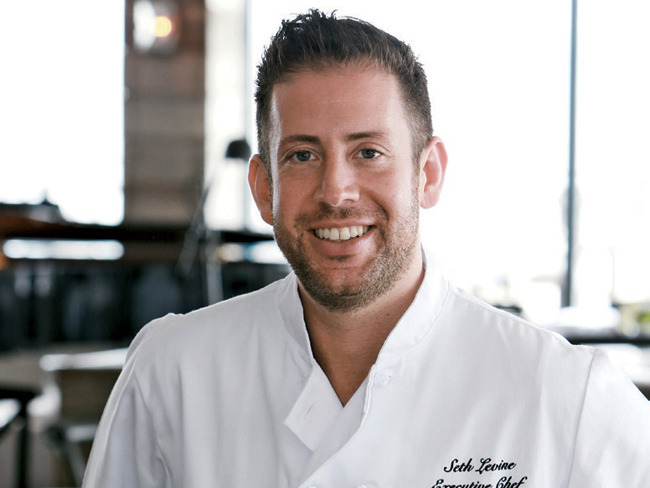 Seth Levine is the Executive Chef at Hotel Chantelle and Ravi Patel's Penthouse808. After appearing on Fox's hit reality TV show, "Hell's Kitchen: Season 5," Chef Seth Levine has been taking the culinary world by storm – a dream he has had since childhood – and he has built quite an impressive resume since leaving the show in 2007. It turns out that Hell was just the beginning. In 2009, Levine opened his first restaurant and became the executive chef at Georgica in East Hampton, later that year also took on the role at Wine and Roses on the upper west side of Manhattan. Since then Levine has created a restaurant group and currently presides over five wildly popular restaurants including The Stand in Gramercy, Hotel Chantelle in the LES and the Ravel Hotel in LIC. Levine has also opened multiple locations of his own, hot and trendy frozen yogurt shop POP YOGURT and most recently opened a late night snack venture called Munchies Joint. In 2010, Levine became a contributing editor to FOOD Magazine, which is distributed throughout the world. In 2011, Levine consulted on reality personality Kelly Bensimon's cookbook "I Can Make You Hot". In 2011, Levine opened as the executive chef, Sons Of Essex on the Lower East Side. Quickly becoming one of NYC's most popular restaurants. Levine recently left to focus on a new project, becoming the host of "Restaurant Insider" for CityBuzz TV which is seen on TaxiTV as well as many other outlets. Levine admits that his passion for food started from a very early age. "I have to believe it is something I was born loving. I was intrigued at such a young age, not only by the actual ingredients but the creation of a dish: the art of plating. I found myself watching every cooking show from "Yan Can Cook" to "Julia Child" and my favorite - "Great Chef's of the World," I can also thank my parents for allowing me to make a mess in the kitchen."